If it's not too much trouble, could someone explain some of the reasons why you picked FVWM over Openbox? (aside from nostalgia) I've only had experience with tiling wm, but lately I've been really interested in trying out a stack wm, but FVWM seems like such a daunting wm to learn to configure. Does FVWM have certain features that simply do not exist in some of the other more user friendly stacking wm, such as Openbox? ILUXA: your fvwm looks lovely by the way! 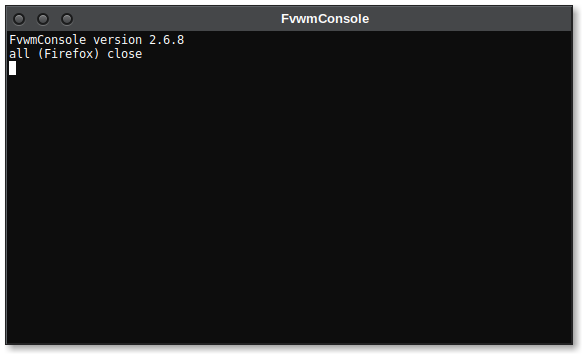 is very useful to check some FVWM functions before adding it to config. FVWM is a much more than a regular WM, because it is extremely much more customizable and usable. FVWM seems like such a daunting wm to learn to configure. There are quite a few tutorials and many sample configuration files. No one will sue you if you copy their configuration files, you know. With time and patience (and RTFM), you'll learn to understand what every line means and you'll be able to customize these files or create your own from scratch. Fvwm can do pretty much anything other WMs do. Every look and feel out there can be emulated. You can give it a twm-like or NeXTSTEP-like retro look or you can make it look like Windows 9x/XP/7/10, macOS etc. It's a very complete WM and if you ever need something that's not readily available you can extend its functionality through Perl scripting. How do you all feel about cwm vs fvwm? I've gotten so accustomed to tiling WMs I don't think I can change permanently, but I've been considering giving cwm a whirl. I could never get used to the limitation of tiling WMs. Don't get me wrong; I like the idea of dividing the screen into non-overlapping frames for most applications. And that's exactly how I use Fvwm: all applications (Internet browser, file manager, terminal emulator, etc.) have their geometries set by Fvwm so that each one fits a specific part of the screen and everything snaps to the screen grid. But I always need to be able to use applications as floating windows, so I see no advantage to having a "strictly tiling" WM. I am repeatedly switching between Window Maker and (currently) dwm on my 15-inch laptop. I just can't decide. The problem is that I don't have many benefits from running more than just terminals in a tiled mode within the limited space. "Hating the touchpad" is not really good enough, especially since most non-tiling window managers have a good amount of configurable hotkeys for anything. Hmm! I was in the same boat on my development machine. I do almost everything code related with the terminal/vim but because I develop a lot of 3D graphics software I kinda need a stacking window manager to test things and run 3D model tools etc. I tend to use FVWM and have alt-1 to alt-9 as normal desktops ("desktop mode") but alt-0 as a full screen terminal ("Terminal mode") using tmux. I also use the FvwmAuto module to change to "desktop mode" when a new GUI window appears. Most of my laptop use is covered by instances of xterm and a few applications that function fine in tiling mode, like Firefox. I can see if you're using applications that essentially "Require" stacking mode like Gimp often it can be incredibly annoying. environment variables on fly, just change it in ~/.fvwm/config and restart FVWM. it should contain necessary dirs like /bin and /usr/bin or FVWM will crash on restart. to use new environment variables in tmux. and it will work much better than any separate drop-down terminal application, like x11/guake eg. It is possible to create such function and then to bind it to some key, in this example I use F1 key. You need to set initial drop-down terminal geometry — "-geometry 185x33" to something that fits your screen. that supports "-name" flag, like xterm, for example. You are right. I had been using autofs/automount and not bothered to install any of the linuxy HAL, DBUS, ck stuff it expects. pcmanfm works a lot better for me after I installed and enabled HAL and started using Console Kit to launch fvwm. No more cores and it even automatically mounts every USB device I can find. I don't use display managers to launch Xorg and had been starting fvwm with just exec fvwm in .xinitrc. Been rock solid for weeks now; thinking of getting rid of KDE. even your file manager trash won't work, if dbus service isn't running. in /usr/local/share/xsessions/fvwm.desktop, to start my FVWM session with x11/slim login manager. I've given up on autofs for now. I sometimes use dolphin (mostly by accident as Firefox wants to launch it to "Open Containing Folder") and it pops up 1000 dialog boxes about being unable to set permissions if I attempt to copy a folder with 1000 files onto a FAT-formatted USB drive. If I stop hald, pcmanfm no longer reacts when I insert a drive, so I thought hal was needed. But I guess this is out of date. I am just too confused about hal, dbus, and console kit. I think I got the last line to launch fvwm from Arch linux. already couple years ago, but I still use it and I like it much more than themes from x11-themes/slim-themes. and add "current_theme fbsd-logo" to /usr/local/etc/slim.conf. Logo was found on the web. In this example middle mouse icon click will kill iconified application. With this you'll get 3 left titlebar buttons. Of course, it is possible to use just "Mouse 1 1 A Close", without creating any functions, but with these functions, titlebar buttons will be clicked only if you won't move mouse while clicking it, this prevents accidental clicking. You should add ImagePath $[FVWM_USERDIR]/dir to your config file, then add *.png or *.xpm (or *.svg, if FVWM built with svg support) images to ~/.fvwm/dir. Super+Q will close current window. First column should be key name, like "Mouse 1" or, for example, "Key F12", to find out key name, use x11/xev. Second column called "Context", context means where this keybinding should be active, for example, in menu (M), on root window (R) (to use bindings with your file manager desktop, "D" should be used), in window (W), window border (S), window corner (F), while using titlebar (1357 - left buttons, 2468 - right buttons, T - titlebar in general), in icon (I), to make keybinding work everywhere, use "A". Third column is "Modifiers", this means what modifier should be used with a key, like control (C), alt (M), super (4), shift (S). To make all modifiers work with a key, use "A", to don't use any modifiers at all, use "N". Fourth column is "Function", desired function should be added here, like "Maximize", "Iconify" or some your custom function.